Conrad Ricamora is known for playing many roles in the entertainment industry. In addition to the fact that his wealth hugely stems from his acting career, he also tops up his bank account with money he makes from music. The Hollywood hunk has been enjoying public attention since 2014 when he was selected to star in the American drama TV series, How To Get Away With Murder. There’s so much more to Ricamora’s versatility, musical and acting skills, and nice-looking appearance than you probably know. Keep reading to find out interesting facts you need to know about the actor. You probably know him as Conrad Ricamora but the actor’s full name is Conrad Wayne Ricamora. He arrived into the world on 17th February 1979 and his birthplace is Santa Maria, California, which is in the United States of America. As you already know, the actor/singer is an American by reason of his birth in California and he has a multi-racial background that includes English, German, and Filipino. After completing his elementary and high school education, Ricamora was enrolled at the University of Tennessee to further his education. Following his graduation from the institution, he proceeded to the Queens University of Charlotte to study Psychology. He eventually graduated together with his mates with a BA degree in Psychology after completing his studies. It was in 2005 that Conrad decided to become a professional actor for the rest of his life and now, he’s having the best of the acting and musical worlds. As an actor, he has been able to switch between Hollywood and Broadway. The actor made his Broadway debut in the Tony-winning revival of The King and I as Lun Tha. The cast recording, in which Ricamora is one of the key soloists, bagged a Grammy nomination for best musical theater album in the year 2016. The star also starred in the Off-Broadway musical, Here Lies Love in 2013, wherein he was cast as Ninoy Aquino. His role in the production earned him a nomination for a Lucille Lortel Award for Outstanding Lead Actor in a Musical as well as a Theatre World Award. Since 2014, Ricamora has been playing the role of Oliver Hampton on the ABC television drama series How to Get Away with Murder. He started featuring as a guest on the show’s second season but was later promoted to a regular in season three. In 2017, the actor found his way back to the Seattle Repertory Theater to join the cast of Here Lies Love as Ninoy Aquino and the following year, he was featured as Xue Xing in the premiere of David Henry Hwang’s Soft Power at the Ahmanson Theatre in Los Angeles. Recently, he reprised his Ninoy Aquino role in Seattle’s revival of the musical, “Here Lies Love” at the hiatus of ABC’s How to Get Away with Murder. He was born into the family of Ron Ricamora and Debbie Bolender. His father, who was born in Manila, Philippines and later moved to the United States at age of 10, served in the US Air Force while his mother is a social worker, who is of Irish/German ancestry. Her husband is believed to have Filipino roots but is adopted. Further details about the actor’s family background, including information about his siblings (if he has any), are yet to be publicized. Is He Gay, Does He Have A Boyfriend? 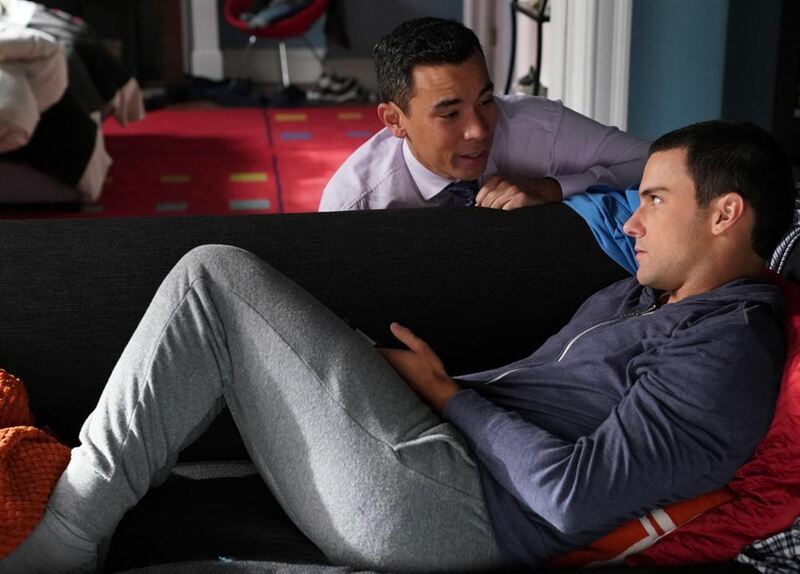 Conrad Ricamora does not only portray gay roles in TV series, in real life, he also shares romantic relationships with people of his own gender. If there is one thing he’s known for, it is the fact that he doesn’t hide his sexuality and he is one of those that encourage people to come out from their closet and be who they truly are. Despite being vocal about his sexuality, Conrad has always shied away from sharing what his love life looks like. While many believe that the actor is dating someone, the movie star has not confirmed or denied if he has a boyfriend. In addition, Conrad has never been linked to any guy either in the past or present. The Californian-born performer, who is best known for playing an openly gay HIV positive fictional character called Oliver Hampton in the TV series How To Get Away With Murder, is a recipient of The Human Rights Campaign’s Visibility Award.